Available in three Drive Unit sizes. Models 600 & 400 shown below, gear box drive designed for continuous run is not shown. Berg Barn Cleaning Systems have the flexibility to fit your barn layout and those special manure handling problems that vary from farm to farm. 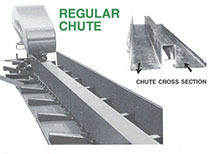 The Standard Chute fits many situations where the barn cleaner instillation calls for side-by-side loaded and empty chutes. 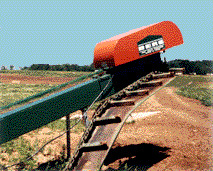 The Split Chute guides the return chain in a straight path back to the cutter. Eliminates a corner wheel and the reverse curve, reducing wear, stress and power requirements.